A month or so ago we were perusing a local thrift store when I noticed this chair. 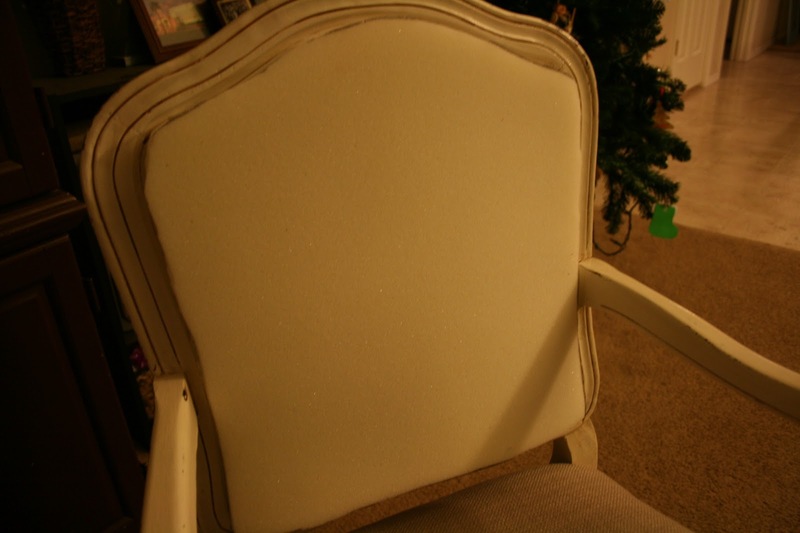 The left armrest was pretty wobbly, but other than that it was in great shape. 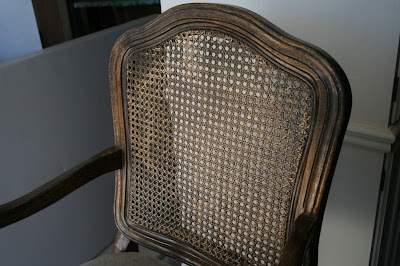 The seat was dirty but in good condition and there were no cracks in the wood. 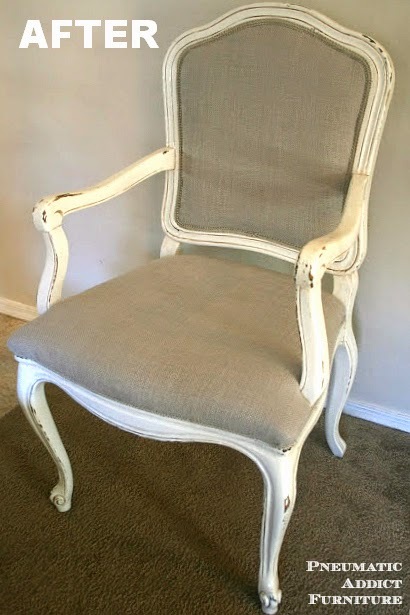 I could see that it was a Louis XV reproduction, probably made in the early 80's, and once I found the price tag I knew I had to grab it right away! After about 20 mins of finagling, we fit it in my car and took it home. First, I removed the seat by unscrewing the 4 screws attaching it to the frame. The next hurdle was to de-wobble the armrest. 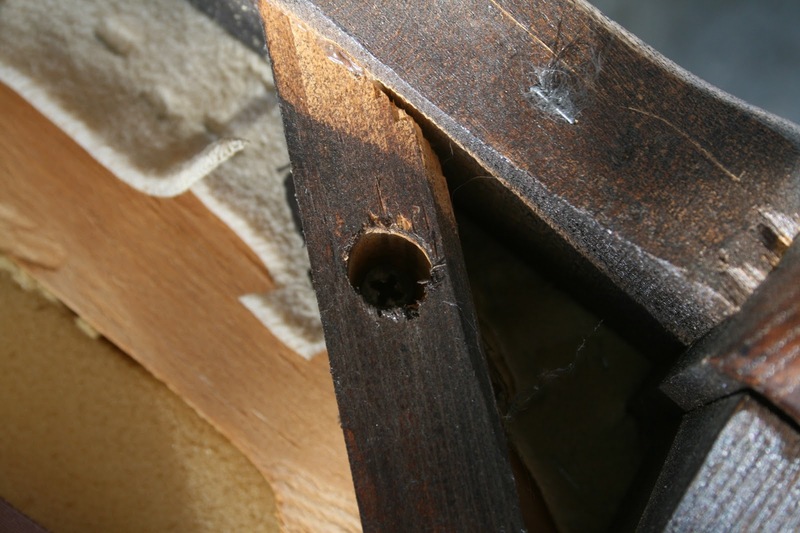 For that I simply flipped the chair over, pre-drilled and countersunk a hole, and screwed in a heavy-duty 3 inch screw.That took care of 90% of the wobble. So, I also added a couple 2 inch finish nails to the back of the frame where the armrest meets. No more wobble! I wanted some paint resistance, so I chose not to prime the frame. I lazily roughed up the surface with some 150 grit sandpaper, just to make sure the whole thing didn't peel off. 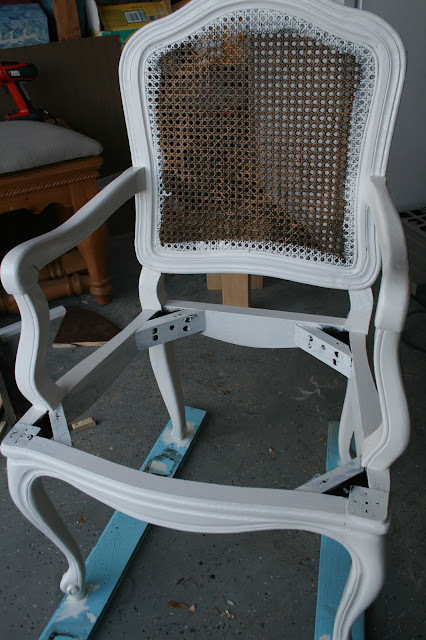 I then brushed on 2 coats of white, latex, semi-gloss paint. The paint I used is supposed to be a "one coat paint" because of it being a "paint and primer in one", but clearly I needed more than one coat. I then applied the glaze. I used Martha Stewart faux effects glaze (not my favorite, but not terrible) mixed with about 10% raw Umber and 10% Burnt Umber. I didn't do a heavy concentrated glaze because I wanted the frame to still look white. I just wanted to bring out some of the detail in the piece. That's part of the reason why I used semi-gloss. I wanted the glaze to only minorly darken the paint color. 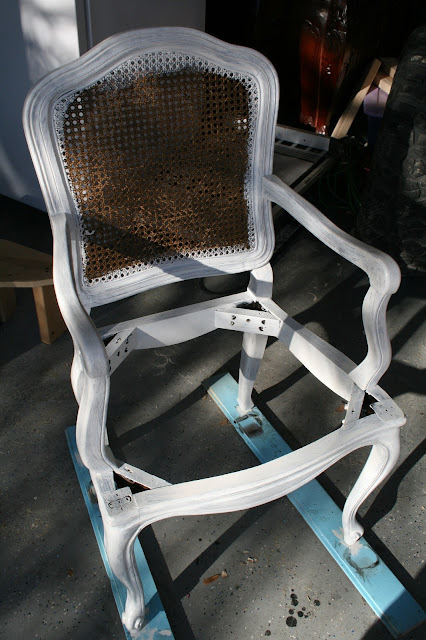 Had I gone with a satin finish, the paint would have absorbed too much color. The semi-gloss finish allowed the glaze to slip right off it. Using some 100 grit sandpaper I went around and distressed the raised areas, causing some chippyness. 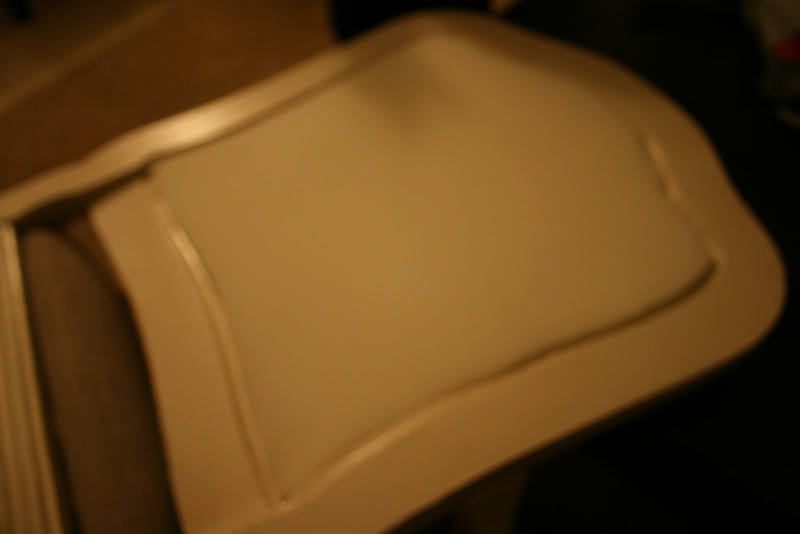 I then sealed it with two coats of my favorite, Polyacrylic in satin. Although it's super smooth and even, it did turn out a bit more shiny than I like due to the semi-gloss paint underneath. Oh well. 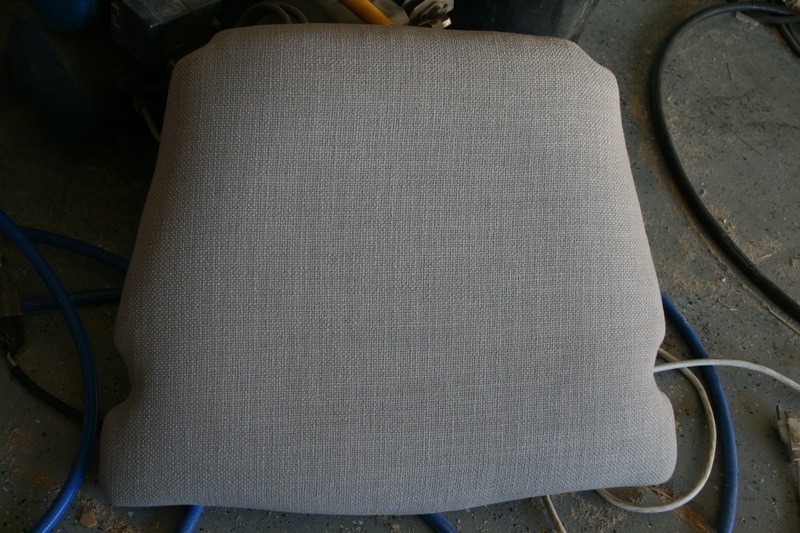 Time to upholster! The seat went quickly. 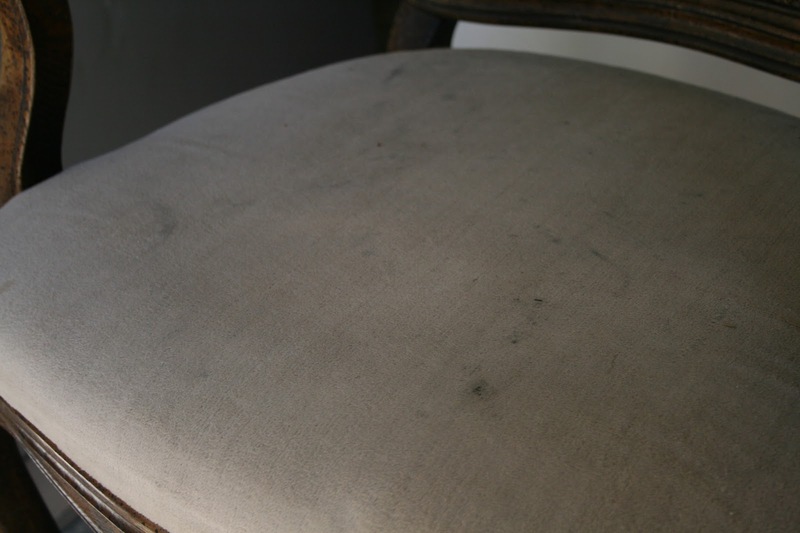 I'm sure most of you have re-covered a seat before, or at least watched someone do it, so I wont go into an explanation on that unless someone asks. Time to address the caning! I really debated on what I should do with the caned back. 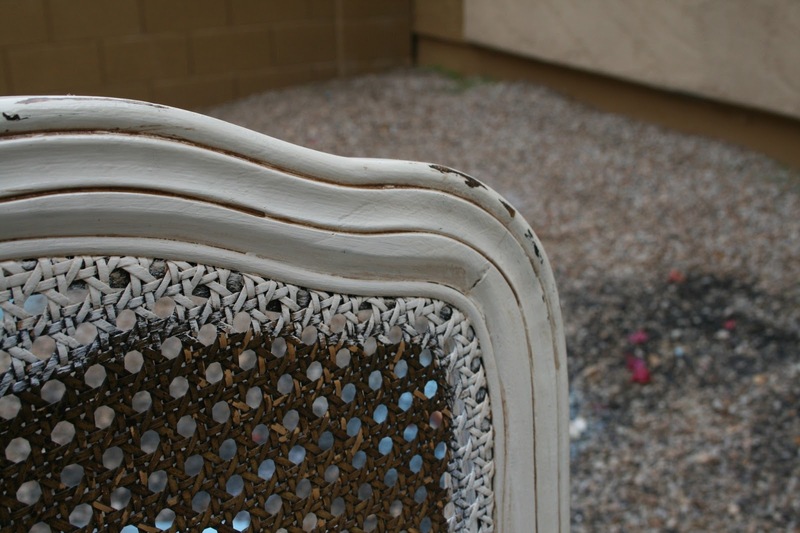 Most people these days see caning and think of their grandma's house and cats. 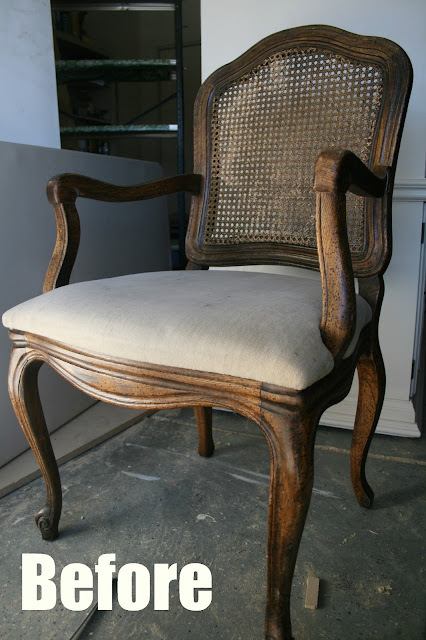 Well, due to the large amount of caned furniture in the mid 20th century, I can see that. It really is beautiful and functional though. 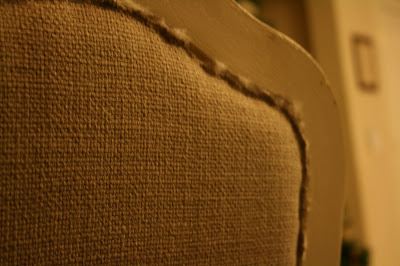 It can stretch over curves, and it gives great texture. In fact, just the other night I was flipping through the most recent Restoration Hardware Children's catalog where I spotted 2 different caned cribs! Maybe it's making a comeback? A lot of the caned chairs you come across second-hand are in bad shape, but this one was intact, making my decision even harder. 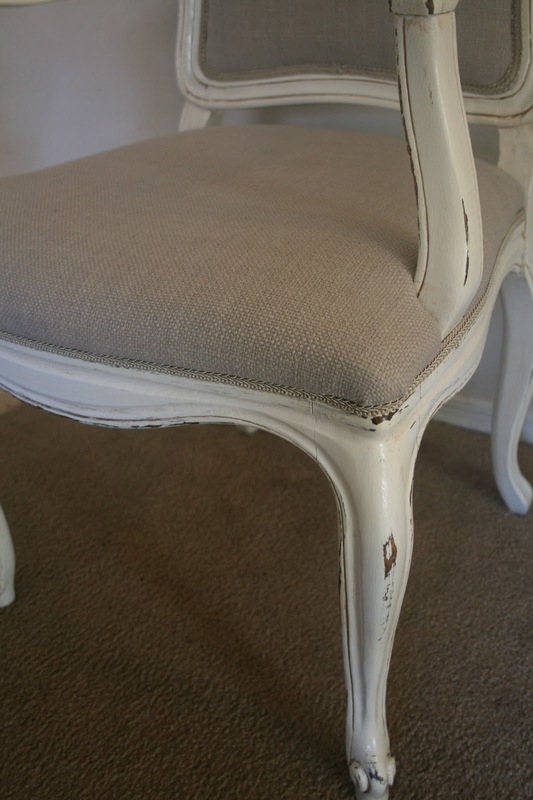 I ultimately decided to upholster over it for two reasons. I wanted to try something new, and I figured it would be a usefully tutorial to most of you. 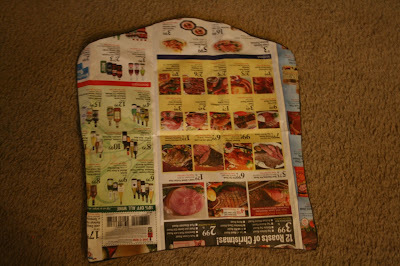 I first grabbed some old newspaper and made a template. 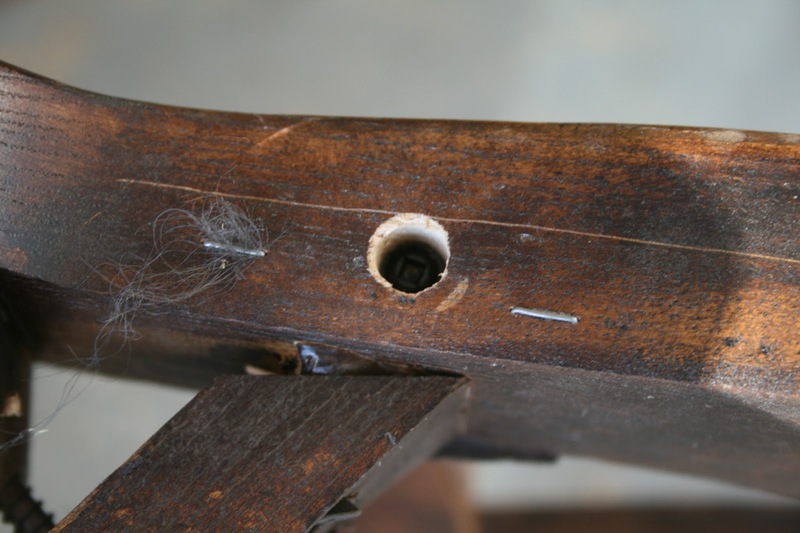 I kept the caning intact because it would be easier than removing it and having to create some kind of sub-structure. Had the caning been removed, it would have made tracing my template much easier. I then transfered the shape to some 1 inch thick foam (sorry, no photos for this step, my battery was charging and I was impatient). I had to reshape the foam a small amount, but it fit pretty well. I then secured the foam with some spray adhesive. I repeated the same process to fill the recessed space in the back of the chair. Next, I cut a piece of batting and a piece of fabric larger than the area I was going to cover, layering the batting first, and the fabric on top. 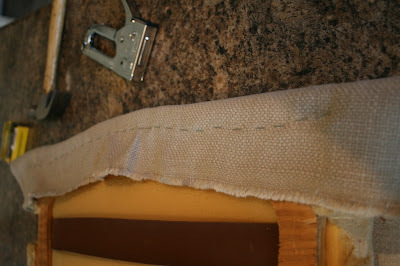 I then went around the opening, stapling to the frame, making sure to pull the batting and fabric taught. With some help from the husband pulling, I secured both layers all around. 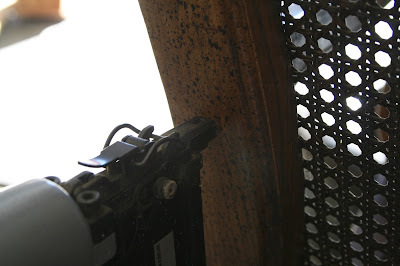 I then trimmed off the excess, cutting close to the staples, but making sure to stay within the recessed grove. This step probably would be easier with a sharp utility knife, instead of bulky scissors. 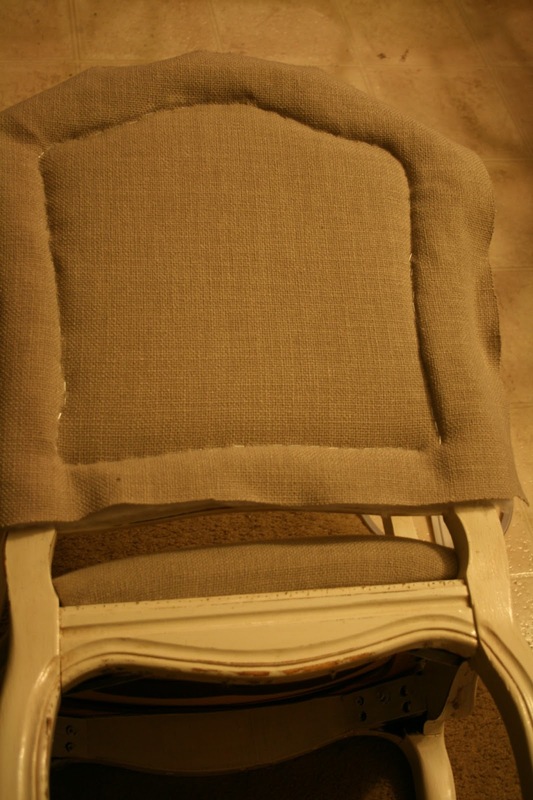 I repeated the steps to the other side and now the chair had an upholstered back. You have some options to cover the staples. 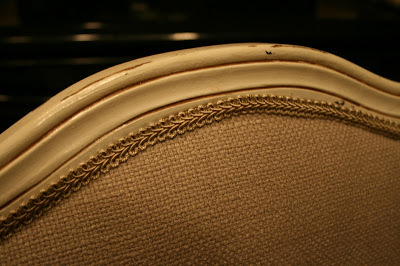 I wanted this chair really look like a french Louis XV chair, so I went with braided trim. For a more contemporary or simple look, I would use double-welting (if you don't know what that is or can't find it, look it up online. There are a few good tutorials on how to make your own). 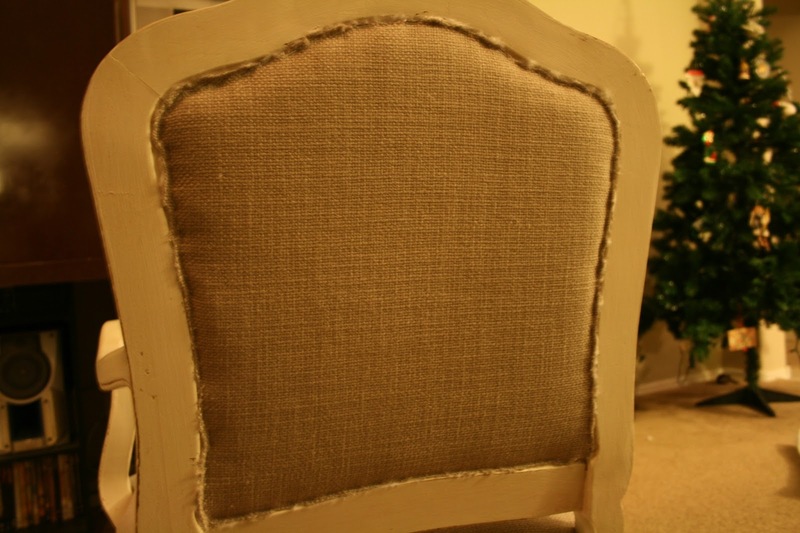 This chair took about 5 1/2 yards of trim. 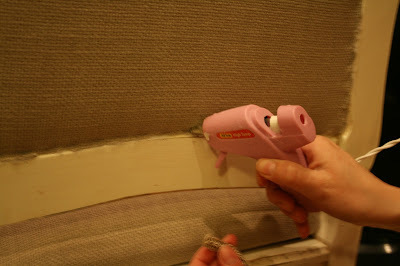 Simply lay down a thin bead of hot glue over your staple line and smooth the trim over the border. Make sure to seal the ends of the trim with a bit of the glue so they don't fray. And that's it! I now have a beautifully upholstered arm chair. I love the fabric! 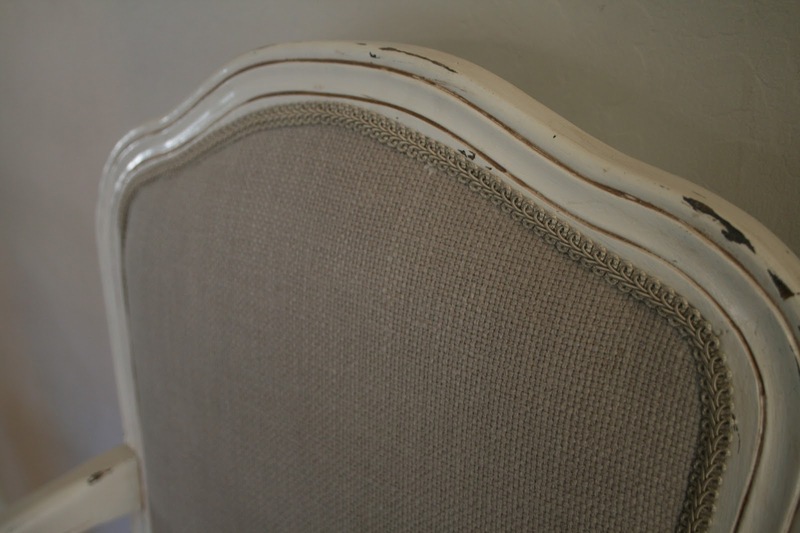 It has some texture but still feels soft, and the color is a perfect, neutral beige. This is a great tutorial. Very easy to follow! Awesome job! definitely a new follower here! I'm so glad I found your tutorial! You make it look so easy! I'm about to redo a dining set with very similar chairs and the caned backs are messed up so I'm going to upholster them. 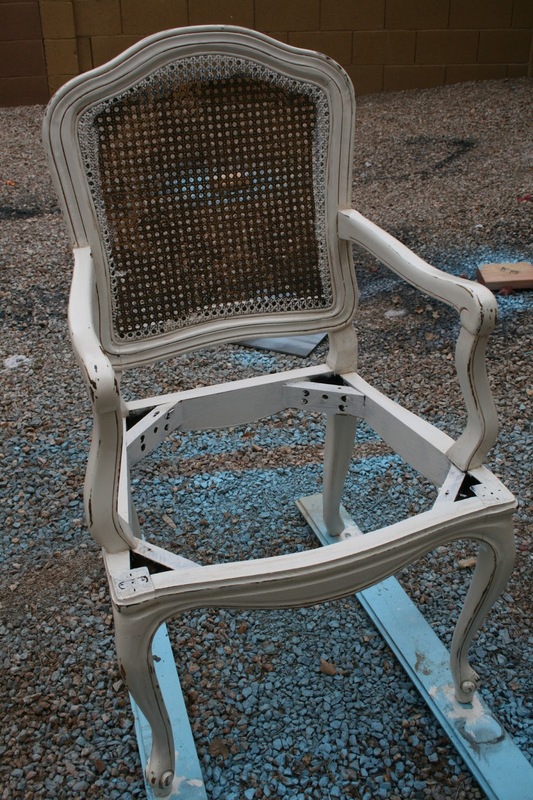 About how many yards (back and seat) did it take to upholster this whole chair? I'm trying to estimate costs before I dive in! Thanks! Thanks for checking my blog out! 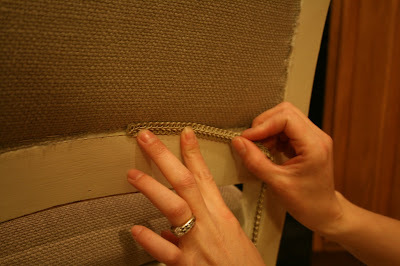 The amount of fabric you need depends on the actual size of the cushions you are covering, and the width of the fabric. I used upholstery fabric, which was 54" wide. I think I used 1 1/2 yards per chair, including upholstering both sides of the back. 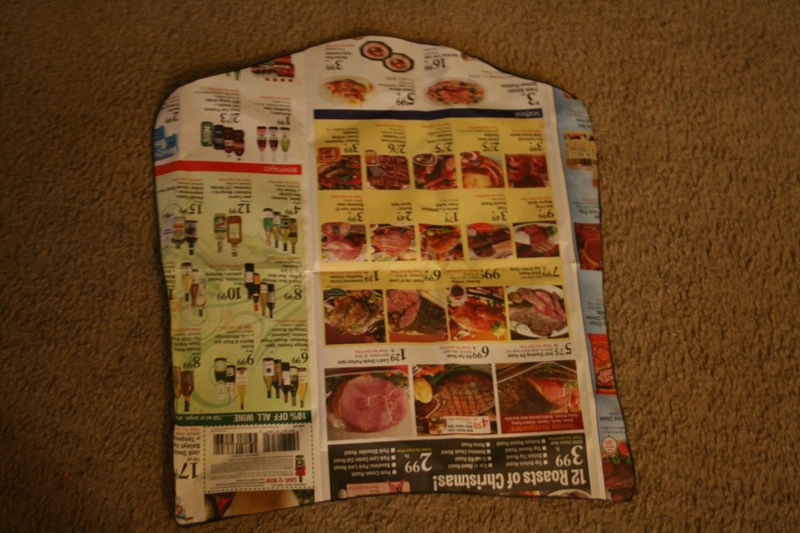 If you are in doubt, make a template of the seat cushion and back out of paper and lay them out on the ground. Just keep in mind, you will need a few inches around to make sure to have enough to pull to the bottom and staple. I hope this info helps! What if the Cane is broken and has holes in it do you still use the same method or do you reinforce the cane with something to keep it firm? It depends on how bad it is. If it was just one of two small holes, but still structurally sound, I would leave the cane the way it is. If its pretty damaged, I would run some upholstery webbing across and staple in place, to beef up the support. Hope that help Ria! 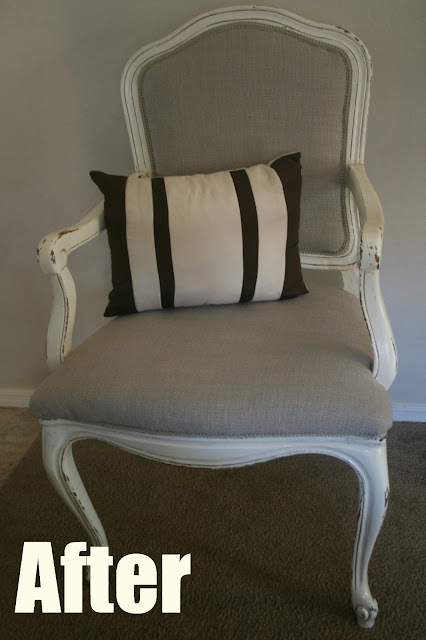 What type of fabric and color did you use? I found it at Joann's in the upholstery section. It was pretty heavy weight, a cool, beige color and had a slight texture to it. I don't know the specific name, sorry. How did you cut the foam? Great tutorial! Thank you! 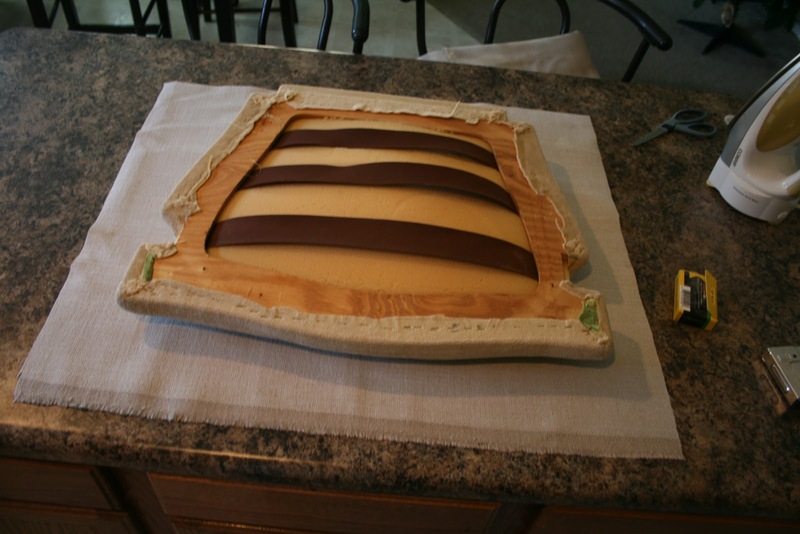 Since this foam is relatively thin, I was able to cut it with kitchen shears. For thicker foam or something I need a really smooth edge on, I use an electric carving knife that I picked up at a thrift store (like the kind you carve a turkey with). It works great! Wow, this is a great tutorial - thank you for the inspiration! It looks beautiful and more classic after the transformation, such a great idea. Thank you for sharing this work of yours, it’s an inspiration. 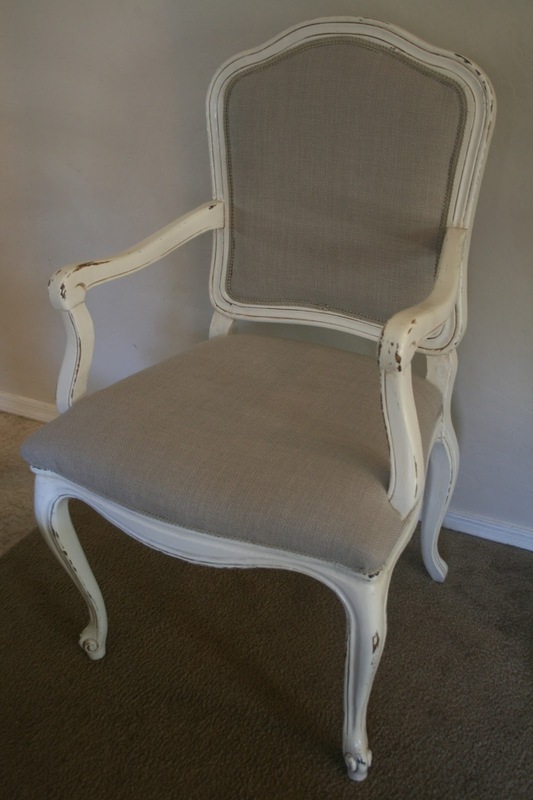 I just bought a chair like this one. The cane is messed up on the back so this is a wonderful idea to upholster the back. Wish me luck. Beautiful job. Thanks for postine. getting ready to try it on my chairs. wish me luck. tutorial will serve as a ready reference. thanks.